Beatrix Potter was influenced by Randolph Caldecott (in whose honor an annual medal is awarded to the artist who has created the "the most distinguished American picture book for children"). 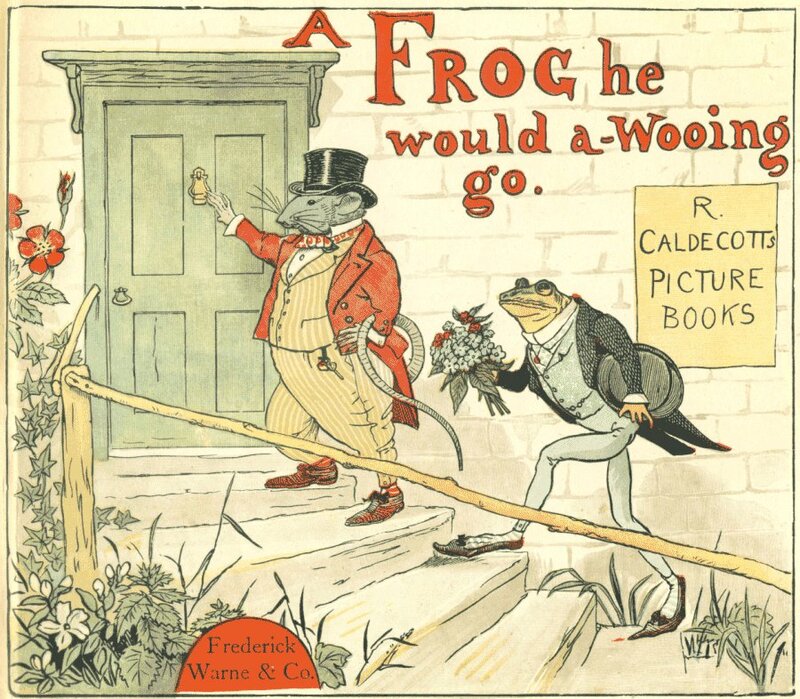 This Caldecott illustration, online via Project Gutenberg, is for the book "A Frog He Would a-Wooing Go" (published by Frederick Warne & Co. sometime between 1876 and 1879). Millais - according to Beatrix’s journal - encouraged her, frequently complimenting her "keen observations." (Beatrix Potter Journal, page 460.) How meaningful such comments, from a well-known artist, must have been! "Whether his Mother would let him or no." "Pray, Mr. FROG, will you give us a song?" "A Cat and her Kittens came tumbling in." "The Kittens they pulled the little Mouse down." "But as Froggy was crossing a silvery brook"
"A lily-white Duck came and gobbled him up." Although Caldecott also included people in his drawings, Beatrix thought she was never good at that. Her illustrations were based on nature, as Linda Lear discusses in Beatrix Potter, A Life in Nature. What made Beatrix Potter a painter of nature? How did she approach her subject matter? Was she influenced by any naturalists who encouraged her work? Bos, Carole "ARTISTIC INFLUENCES" AwesomeStories.com. Dec 01, 2006. Apr 25, 2019.